Hey Fiverrs, is there a space for Indian sellers on Fiverr? This is one of the questions we get in fiverr forum all the time. A lot of people thought that fiverr only favors people from North America and Europe. Nope, it is not true. Fiverr is a global marketplace, and people from all over the world are doing fine selling what they know. 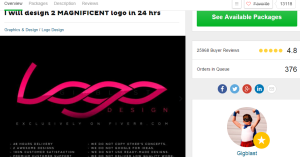 If you’re not sure if Indian sellers can make huge money on Fiverr, these top 3 logo sellers will blow your mind. 1. Gigblast. If you’re a greedy person this seller can make you loose control. The amount of orders on queue everyday is more than the monthly salary of millions of people across the world. Amazingly, he is from India, and also a top rated seller. The screenshot below is one of his gigs on Fiverr. According to him, the monthly earnings on fiverr is between $8,000 and $25,000. Gig blast has been on fiverr since 2013 and has more than 30,000 reviews. Check him out and learn how to become a supper seller like him. 2. Icongraphics. is the second super seller from India. He is one of the highly talented Indian graphics designers. His logo design gig is selling crazily on fiverr. Averagely, his daily orders are 300. You can do the rough estimate of his daily earnings on Fiverr alone. this person is rich i must admit. He joined fiverr in 2012, and has more than 5000 reviews. click the username to check his supper selling logo design gig for inspiration. 3. Srishet123. The third seller on the list is also a top rated seller. 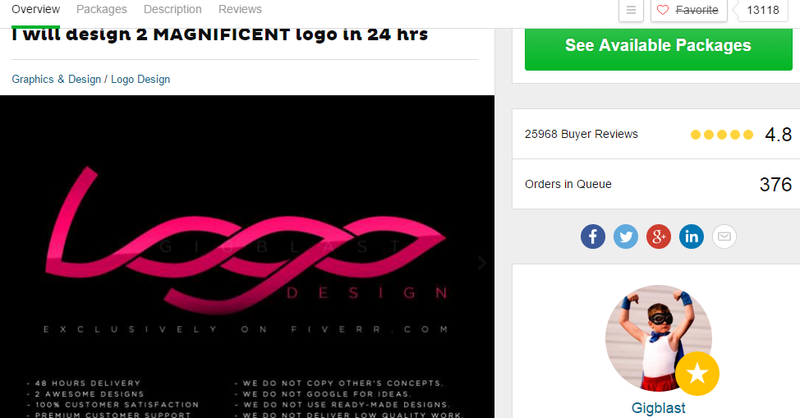 Of course, these sellers have high ratings and fiverr respond to their message very fast. they are doing pretty fine and making huge money just by doing logo design. Srishet123 has 50+ orders in queue on his logo design gig at the time of writing this article. He has been on fiverr since 2013 and has more than 18,000 ratings. click the username to visit the gig page and learn from them. There are other supper sellers on fiverr that are also from India. In fact, there are other logo designers from India that are doing pretty well like those listed above. This write up is based on popularity and how their gig is ranked on Fiverr. And note that i am not affiliated with them whatsoever. I am not advertising them or convince you to buy from them. However, if you find them amazing, you can patronize them or learn from them. Sir Great people especially gigablast start at the beginning when fiverr start in market they see and opportunity and start selling . Great to know that gigablast inspires you.